Issued in 12-panel Digipak with white tray including 8-panel fold out poster. Circular green sticker with Aphex logo, title and cat# glued to front or back. Cover artwork is a cost listing of the advertising arrangements for the album. The poster contains a schedule of the used musical equipment. Im not going to whine about the lp pressing because I don't buy vinyl but the cd sounds amazing. Even in 2019 I am amazing how complex yet how much more accessible this release is compared to some of Aphex's releases in the last decade and a half. He focuses on really interesting rhythmic juxtapositions but utilizing sounds and textures we electronica fans are most familiar with i.e. a ton of analog bass lines, sweeps, drum sounds and so on and so forth. A really solid effort I only recently have learned to appreciate but then again AT is like vintage wine it never gets rancid only improves thru age adding complexity and finesse! His name is Richard, he is one of Electronics greatest ever artists, he does it his own way if you don't like it don't buy it. Simple really. This is an okay release but I really can't understand the fuzz many people make about "Syro". Formulaic drivel. No fresh ideas. Another 90s legend sinks to new lows. By far Richard's best work in the album format. It's difficult to compare to the SAW series, but shits all over I Care Because You Do, Drukqs and especially RDJ Album. It's not perfect though, more of a compendium of the quintessential Aphex Twin style that probably mostly just appeals to the fans. Then again I think that's the albums goal anyway, instead of trying to reach for some kind of universal appeal. Shame "Marchromt30a Edit 2b 96" is only on the Japanese edition, definitely one of the most interesting tracks on the album. This album felt so different in the best way possible, its nothing like any of Richard's previous releases to my knowledge and the extensive use of analogue gear gives the music a really wholesome and satisfying sound. All the tracks have a very dry and robotic feel whilst still maintaining Richard's signature virtuous, intricate and totally unique style! I defiantly recommend this for everyone, also, listen with headphones that have good a stereo field because the panning is amazing on this release! Oh, and the last track, "Aisatsana", is the most beautiful thing I've heard for a long time. A perfect ending to such a greatly anticipated release. 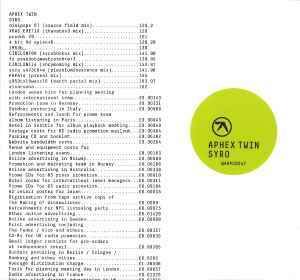 typical aphex twin album. sounds nothing like previous albums and like nothing else out there. 10/10. excellent. I100% know i wont find a better track in my lifetime.